Best. Book. Of. Ever. The End. 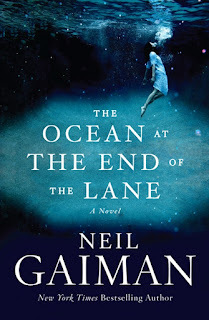 You are going to see a lot of reviews like this over the next few days and weeks and months about The Ocean at The End of the Lane by Neil Gaiman and here are some of the reasons. It's got a gorgeous cover and a mysterious title which hopefully means lots of readers will pick it up and give it a try. If they do, they're probably going to love it. It isn't a long book, only 178 pages, so it's easy to get through in an afternoon or evening. Many readers will do just that. I finished it less than twelve hours after it landed on my door step. It would have been sooner if I hadn't had to eat or take care of my child. It's a perfectly-paced, imaginative, slightly-dark tale full of beauty and wonder, sadness and love. Pretty much, it's a perfect Neil Gaiman story. It's also just a perfect story. 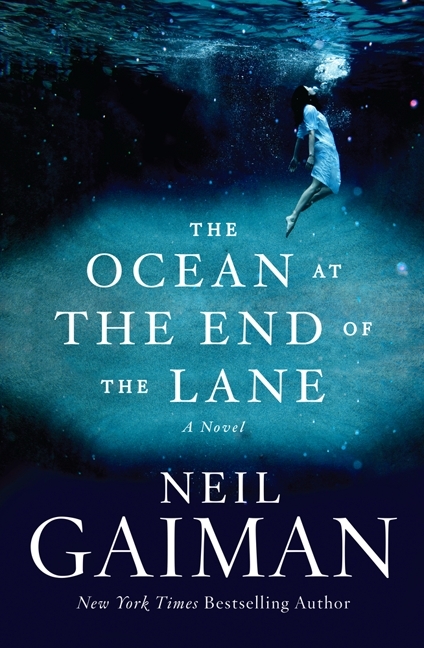 It's a great entry novel for readers who haven't tried Gaiman before. It's easy but incredibly deep -- kind of like Lettie Hempstock's ocean (which you'll have to read the book to find out about). I could go on about characters without names, opals, kittens, water and shadows but those are just details, bits of the story. The perfection of the tale is how Gaiman brings it all together, holding the reader's hand through nostalgia, comfort, sadness, fear and forgetfulness. So when you see the positive, gushing reviews, let them lead you to your local indie bookstore where you can pick up a copy. Must. Read. This. Good review! I CAN'T WAIT!!!! I have a reserved copy for him to sign next week at his reading, and I'm beyond excited. I preordered this months ago from Barnes & Noble, I'd completely forgotten. But only 178 pages??? That's not enough Gaiman! I sure think it is and I hope you will too. On my list!!!! Can't wait to read this one! My husband is getting this for his birthday in July- can't stand that I have to wait until then to read it!! Oh, that's a hard wait! I just read this one this weekend, too! I don't think it ranks as my favorite Gaiman, but it certainly has a very distinctly Gaiman tone :) it reminded me more of Starsust than his more recent stories. And it is one I will be thinking about for a long time, I can tell! I didn't think about ranking it. I think I would have to read it again to decide for sure. I liked it more than American Gods and possibly even more than Neverwhere and Graveyard Book. I recently reread Stardust and totally fell for that story again though so this one comes close to that but might not top it. I do want to hear the audio version of Ocean because Neil's so fantastic at the readings. I'm so excited to read this. I'm thinking about maybe reading it to my little sister when we go on vacation? I think it would read aloud well, and it's not very long. Then we could both read it for the first time at the same time and that would be lovely. That would be pretty fun. If it wasn't for a single horrid scene, I was considering reading it to Z. It'll have to wait a little while though until he's a bit older. This one does seem to be spreading all over the blogosphere, and all positive. Now I have to figure out how I can get hold of a copy! I'm sure it's a bit stacked because Neil's fans will be the ones who read the book immediately but hopefully new-to-Neil readers will love it too!